I was talking to some tea people a few days ago and came to the conclusion that we all were drawn to this drink while searching for more grounding in our lives. For Kenny, another tea friend, he takes this further by looking at the larger historical and cultural context behind Chinese tea. It’s something that he became interested in five years ago, and he’s been utterly passionate about wanting to share this knowledge and appreciation with more people. Last year, he had a tenmoku tasting session (which I wrote about here) and this year, he’s broadened this to a three-day exhibition titled Remember Ming, featuring tea, handcrafted ceramics, Han ethnic clothing, and incense. I dropped by this afternoon for a talk and learned so many new things, such as the suppression of Han ethnic clothing during the Qing Dynasty and the poetic philosophy behind incense production. The sub-head of this exhibition is “the old is new again” and I find it to be such a fitting way to capture Kenny’s holistic reverence for these traditional cultural products which most of us take for granted. It may not be the trendiest or most profitable project to embark on, but he has certainly utilised his talents and experience well with Remember Ming. As someone who loves tea, I appreciate how this drink has given me more exposure to the Chinese culture and language. And today, this exhibition provided a fitting reminder that even though I grew up in a Westernised environment, it does not mean eschewing everything else that is not. There are always things to learn. If you feel like you need a time-out from the festive hustle and bustle, this cultural exhibition might make a nice change. The exhibition is free and will be happening this weekend (19-20 December 2015) from 11am-7pm at Tian Fu Tea Room (Park Royal Beach Road). There are 2-hour talks happening at 11am and 3pm on both days – admission is $45 and comes with tea and dim sum. For more information, please visit the event website here. Images courtesy of Erwin Tan. 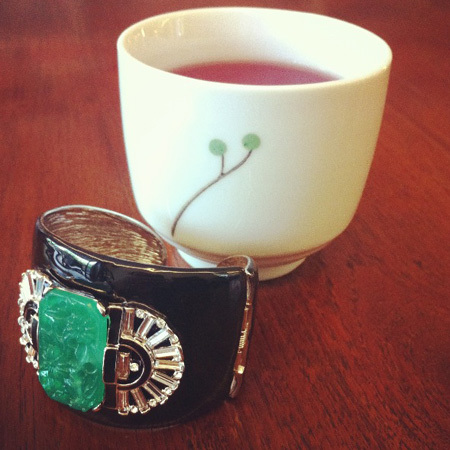 While I’m more of a Chinese tea person (now), I’ve never lost my fascination with Japanese tea. I love Gyokuro and Genmaicha and I still have many lovely memories of drinking the freshest, tastiest sencha in Shizuoka all those years ago. I was invited by Kaylin, another tea-loving Singaporean who is distributing Keiko Japanese Green Tea in Singapore. 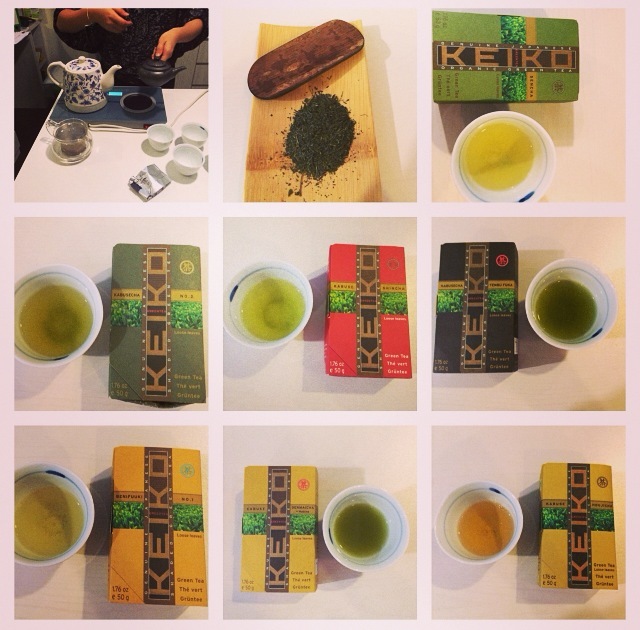 Keiko is a German-Japanese tea brand that has a plantation in Kagoshima in Southern Japan. It’s supposed to be a really fertile area because there’s an active volcano nearby. Their teas are also Certifie Agriculture Biologique organic-certified and is also packed using some high-tech method involving nitrogen to retain freshness (sorry, these techie things I tend to gloss over). But yes, some excellent quality tea here! Sencha: This gave me an idea that I was in for some really good teas ahead. It was a smooth, almost milky green tea that left a slight apricot aftertaste. Kabuse No. 2: Kabuse is a semi-shaded type of green tea that is known for its sweetness and aroma. It is not as “umami” as a gyokuro, but it definitely has its charm. It reminded me a bit of a green bean soup dessert, very drinkable and refreshing. Shincha: This is a rare batch of early spring tea that is actually fluorescent green. Interestingly enough, there’s this slight citrus afternote – a taste profile I’d never expect for a Japanese green tea but oh well, you learn something new everyday! Tenbu Fuka: I really like this tea, it packs in a super umami punch! The Tenbu Fuka is plucked in mid-April and has a dark green liquor colour because it has been intensively steamed. Benifuuki: This tea is supposed to have a really high content of EGCG3 (the antioxidant that green tea is known for) which is supposed to help with sinus allergies. It’s also the most bitter of the lot – apparently, many Japanese love this tea and drink copious amounts of it before winter season starts. Kabuse Genaicha + Matcha: My absolute favourite of the lot – I bought a box home and it’s my morning “start-up” drink now! Kaylin pointed out that even the roasted rice puffs in this tea are organic. Might I also add that they are also incredibly fun to crunch on after I’m done brewing the tea 😉 Usually, Genmaicha can get pretty weak on the green tea part, but because of the matcha, this tea really packs in a punch and is a beautiful dark jade colour. Kabuse Houjicha: This roasted tea is very malty and caramelled ( “mass houjicha” served in Korean and Japanese restaurants and sold in Daiso pales in comparison in terms of intensity of flavour) and I love the slightly bitter vanilla notes at the end. I would like to try this iced sometime with perhaps a little drizzle of honey! Overall, I really enjoyed my first Keiko experience and it’s actually pretty affordable too with prices ranging from USD$9.60-48.10 for a 50gm box. Again, SO HAPPY more great tea is making its way to Singapore! – Selected health shops such as That Health Shop (Roxy Square) and Lins Healing Concierge (Valley Point). *From 1-14 Sept 2014, there’ll be a Keiko tea booth at the Level 2 Atrium of Westgate Mall where you can sample and purchase their teas! Do drop by if you happen to be shopping there! And lastly, feel free to join their Facebook page and/or Instagram page (@keikoexperiece) for all kinds of Japanese tea trivia and pretty pics. Hi Alison! Tell us about how you fell in love with tea. I come from a very sociable family. The kettle was always on, and there was always lots of gossip going on over cups of tea! My grandmother always made loose leaf tea and gave it to all the children in the family with milk and sugar. How did you get into tea ware design? I worked as a design consultant to La Cafetière for 10 years, and they sold products dealing with coffee, tea and hot chocolate. This sparked an interest in the history of the tea trade. I then made a few visits to China and fell in love with tea. I think the story of tea (and all the beautiful products that have been created in order to serve it) is amazing. The history of the tea trade and tea’s extraordinary popularity of being in almost every home around the world makes it a subject worth studying. At the same time, it is very important for me to make things that are useful as there is a lot of unnecessary ‘stuff’ in the world. 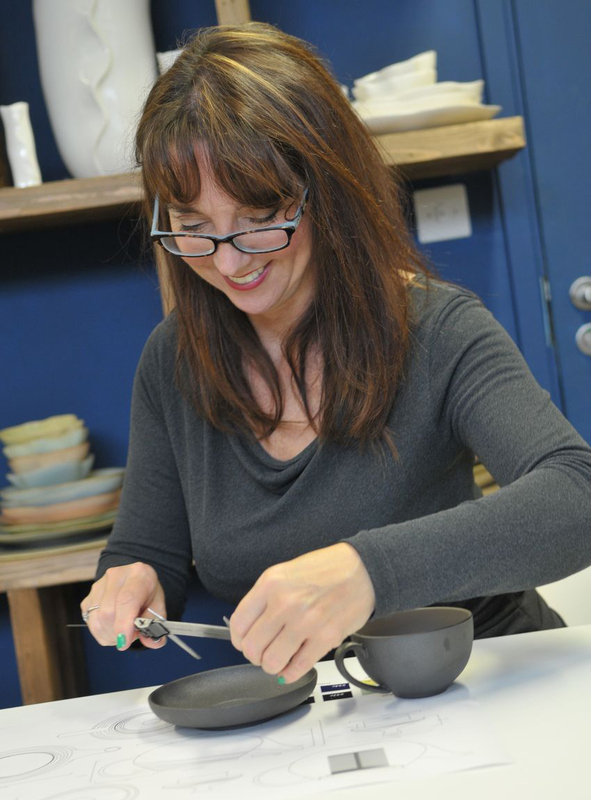 I want my pots to be enjoyed and used all the time, not just for special occasions. You’re “anti-teabag” but the teabag is such a British institution – how do you deal with this? Unfortunately, the teabag is the most common way to make tea in the UK because it is perceived as being quick and convenient. As a result, many people are used to the very blunt taste of (mostly poor quality) teabag tea. However, I am very happy to report that there is a growing interest and appreciation of loose leaf teas. We hold monthly tea tasting sessions in our studio during which we take a look around the world and taste a huge variety of Chinese, Indian, Sri Lankan, African and other teas. We have also selected a range of blended and flavoured black teas. Once our visitors taste these teas, they realise how much finer they are compared to the standard teabag. They also see how very easy it is to prepare loose leaf tea without any fuss or mess. Some of your tea ware designs incorporate Chinese and Japanese tea ceremony elements – what sparked your interest in these aspects of tea culture? My first collection was inspired by the history of the tea trade in the UK. 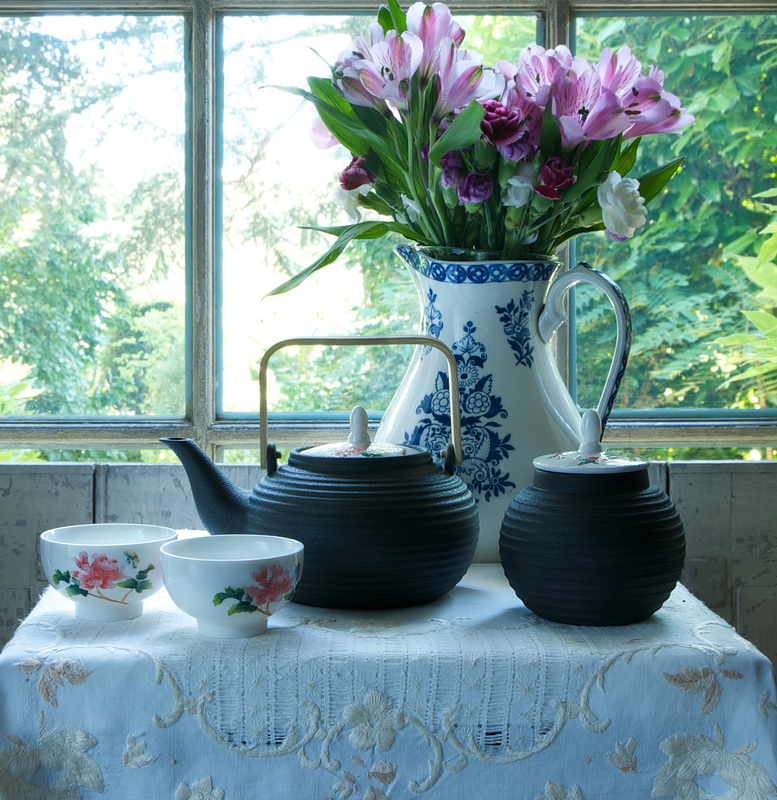 As tea was introduced to the UK, Chinese decoration motifs were used everywhere. This period saw the birth of British Chinoiserie, Ming vases, Chinese wallpaper, Thomas Chippendale furniture used by famous characters such as Jane Austen and Earl Grey. It seemed like an obvious place to start. My first collection was Darcy, named after the famous literary hero himself. Jane Austen would have drunk tea all day long and it would have been Chinese tea bought from Twinings. 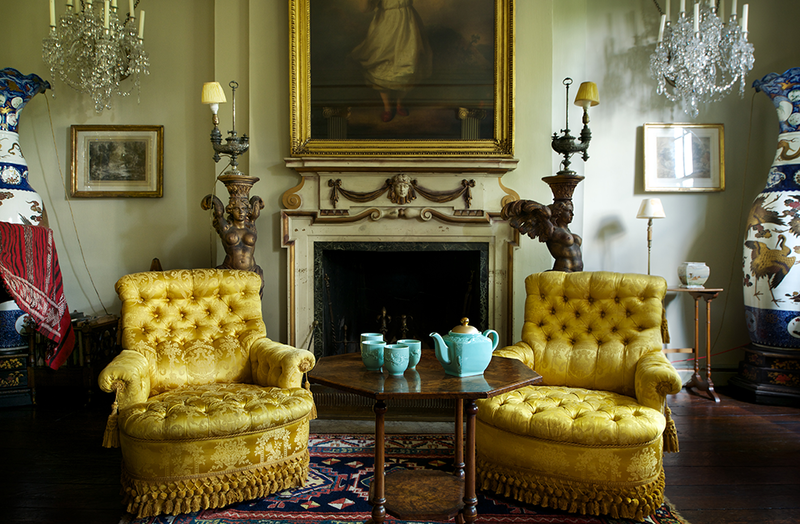 My favourite design is your Golden Carp Series – how did you get your inspiration for that? As my collection is quite small, I wanted to ensure there was some variety in the range. This one is the most glamorous and has a bit of bling! For Golden Carp, I wanted to fuse a European shape with Oriental imagery. 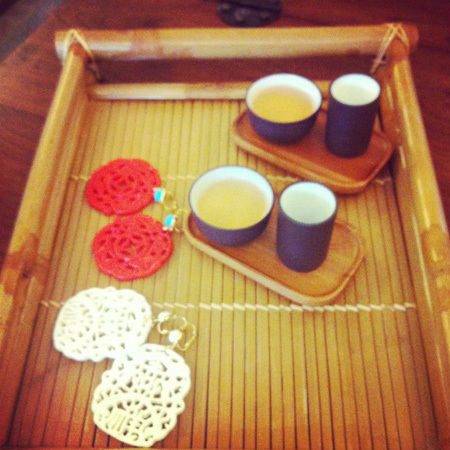 Everything about this set symbolises good fortune: the carp, lotus and gold are all auspicious. 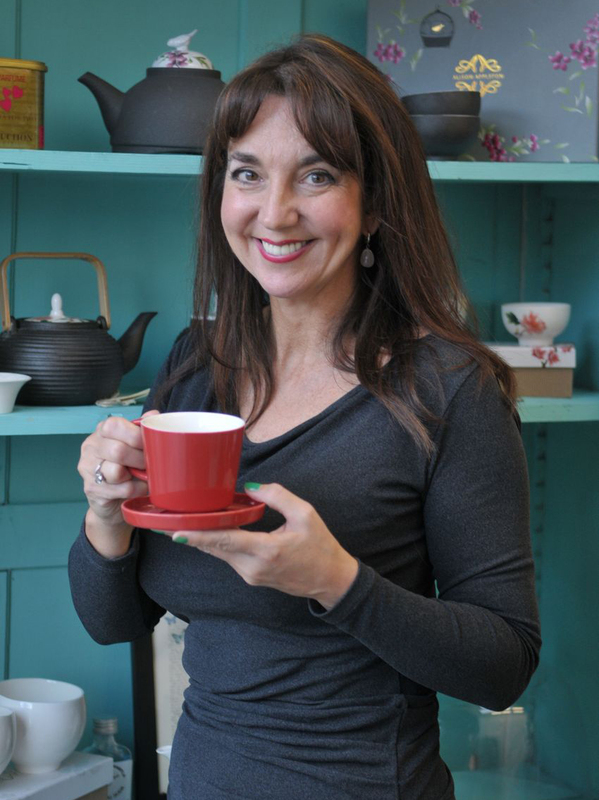 What kind of message do you want to send about tea with the kind of tea ware that you create? That tea is special and we should make it properly. When you consider the effort that goes into growing, picking, drying and rolling a whole variety of exquisite teas, it is only correct that we brew them in lovely tea ware. Good loose leaf teas are relatively inexpensive and can be enjoyed by everyone. I see the new interest in tea as being similar to the recent growth in the coffee business. Today, a huge proportion of people in the UK have espresso makers at home and enjoy a variety of espresso based coffee drinks every day. I hope that one day, consumers will be more demanding when it comes to drinking good quality tea. What is your most memorable tea experience so far? I visited a Longjing tea plantation as a guest of a family who had a share in that plantation. They gave me a delicious lunch, and after that, we drank pre Qing Ming Longjing tea all afternoon while sitting outside in the sunshine on a warm autumn day. The plantation looked beautiful and everything was delicious. I felt very lucky to have such an experience. What is your tea ritual? I usually drink Uva Pekoe from Sri Lanka for breakfast. This has a strong and malty flavour that goes very well with sourdough toast or my usual bowl of porridge with honey. Mid morning, I will make a pot of Da Hong Pao or another Oolong. Lunchtime, I’ll go for something like a black tea with rose. In the afternoon, I will always drink green teas as they give me a lift. Before bed I like something light and delicate like a white tea. Tea is a comfort. It revives and soothes, and always features at important occasions when friends and family are together. Connect with Alison (@AlisonAppleton) on Twitter! Lianne with her husband, Salmon. They love drinking tea (even though they have a “Drink Coffee” poster behind them) and have just set up an online designer fashion jewellery store called Pinwheel Jewels. Image courtesy of Jimmy Sng. Lianne is a dear friend whom I have drunk many cups of tea with. In general, we talk about things like LIFE and FINDING PURPOSE…thank God there’s tea to mellow us down as we meander around these abstract topics. I’m really happy for her because she’s found something that suits her priorities and interests – opening up an online designer fashion jewellery store called Pinwheel Jewels with her husband, Salmon. She has a wonderful artistic eye, a sophisticated fashion sense and is a whiz in all things logistical – a perfect combination for such a business if you ask me! Tell us more about your love of tea. I start the day with tea, and I often have a pick-me-up in the afternoon as well. I started drinking tea as a child, and I remember the dentist asking my mother whether I drank tea because she could see tea stains on my teeth! Tea has become something comforting, and you can always find the right tea for every occasion. My husband also enjoys tea – we liked it enough to include it as a wedding favour for our guests when we got married. What are your favourite teas and why? I must qualify first that I’m not a tea expert, I just drink what I like and what seems fitting for the occasion. For cold teas, I like an iced Darjeeling. Our family has lived overseas twice, and during winter, I love a cup of chai. The spices are warming and the milk is so comforting. 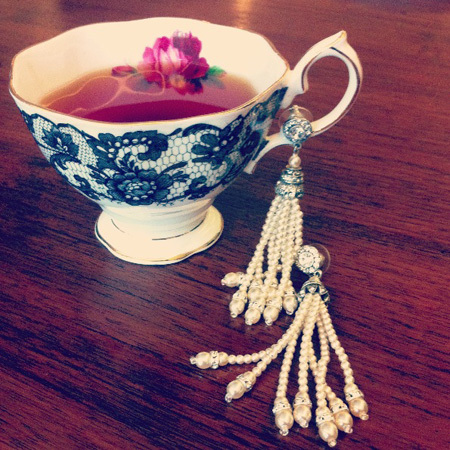 Describe your most memorable tea moment. 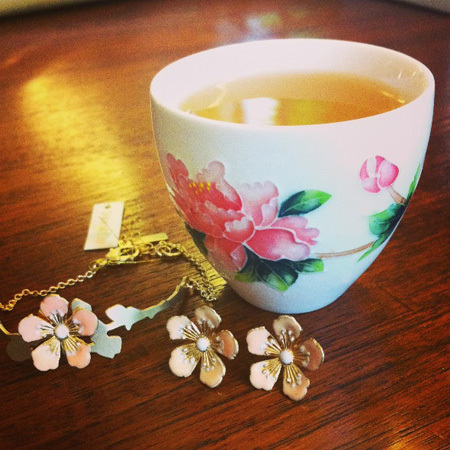 How is wearing jewellery similar to drinking tea? Jewellery is not only a way to express personal style, but also a way to make memories. I’m really sentimental about my jewellery, whether cheap or expensive. I always remember who gave what to me, during which occasion and why. It’s my time capsule. Similarly, certain tea blends can send me back in time and I’ll recall when I last had this tea, how I was feeling then, and whom I was drinking it with. PINWHEEL JEWELS IS OFFERING TEALADYMEL READERS 10% DISCOUNT ON PURCHASES S$200 AND ABOVE! YAY!! Promotion valid till 31 July 2013. I really enjoyed researching this article because it just showcases the versatility of tea so well – though I am not really any sort of chef, I feel inclined to throw in some Longjing into my chicken soup the next time round. The full article can be found here. 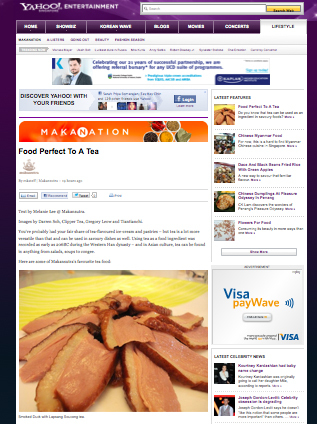 Another tea-related article that I did for Makansutra/Yahoo Singapore. I’m so happy to have found a Chinese restaurant that respects tea as much as their food in Singapore (see Tian Fu Tea Room)!